I’m not even going to pretend to be coy–I am not a flexible person. I am a list maker, a schedule planner, and if I have plans please don’t change them, I may freak out. Just ask Andy. I’ve gotten better since we’ve been married, but early on a simple unscheduled change to my plans would send me into a tail spin. It wasn’t pretty. A while back I was all set to try out a new recipe–Pistachio Kebabs on rosemary skewers (from Yummy Supper) served with Middle Eastern cauli-rice pilaf. I had already made some slight changes to the initial recipe–it was the middle of February and I didn’t feel like standing outside to grill, so the “skewers” were going to become meatballs. Andy doesn’t like a lot of rosemary, so I was going to mince up just a few needles and mix it in. Everything else was the same. I was going strong. I had plenty of time before Andy would be home and back again from his evening walk, and even though the recipe itself was new, I know how to make meatballs so I wasn’t stressed. I shelled the pistachios, chopped the herbs, cooked the onions and set them to chill, and went to grab the meat from the fridge. This is where something went horribly wrong. The meat that I had pulled out of the freezer 24+ hours ago was still frozen. I took a deep breath. I hoped I was wrong and it was just the stiff butcher paper that wouldn’t give when I squeezed. I removed the wrapper, placed the meat in the bowl with the herbs and onions and took another deep breath. It wasn’t the paper. After the first 1/4 inch the meat was still frozen solid. I took a fork and tried to break it apart. It didn’t work. There was no way I was going to be able to make this frozen meat soft enough to make meatballs for dinner. And this is where I should have freaked out. In the past, something like this would have been a disaster. At best, there would have been tears and anger. At worst I would have thrown the whole thing out and told Andy we were going for take out. With our current lifestyle and income, throwing out an entire meal’s worth of ingredients just isn’t an option. I started thinking… I had already planned to make Middle Eastern cauli-rice pilaf, so what if instead of meatballs, I just sauteed the frozen ground beef with all the herbs and pistachios and mixed it into the pilaf? A Middle Eastern rice bowl if you will. It wasn’t the meal I originally intended, but it was worth a try. Anything was better than throwing the food away. So I got to work. And you know what? It was a good meal and I discovered some things I would do differently next time, like make sure I add the pistachios after everything’s been cooked. They got a little soggy and disappeared. Also, it could have used a little extra parsley and a little more cumin. Growing in patience is never an easy thing. I know that it’s been God’s work on my heart throughout this journey that got me to the place of acceptance and flexibility when a meal didn’t go as planned. His patience with me is abundant indeed! I’ve only made this recipe the one time, so I know I should add it to an upcoming meal plan. If it’s as good as I remember, I’ll post it here so you can enjoy it as well. Some people I know shop solely at New Seasons and Whole Foods, and I totally get it. Those places are great sources for healthy food. They have beautiful produce sections, solid meat and dairy, and let’s face it, bakeries to die for. I do the bulk of my shopping at Winco, with stops at New Seasons, Trader Joe’s, and Fred Meyer to supplement what Winco doesn’t have. Why don’t I do all my shopping at these other places? Because we have a grocery budget and the way we eat now isn’t cheap. After Andy was diagnosed with Type 2 Diabetes the way we shopped for groceries changed, and our weekly grocery expenses went up. Sticking to a budget has always been important to me, and I didn’t want our budget to suffer because of our health (or vice versa) in order to afford an $8/lb. bunch of asparagus. I knew we wouldn’t always be able to afford organic produce (thankfully, we have a garden full or organic veggies), but incorporating more fruit and veggies into our meals was a necessity. I don’t want to start a political discussion about the virtues of eating locally sourced food, but I wanted to share where and how we shop for groceries because I know how expensive it can be to start living a healthy lifestyle. Good-for-you food isn’t cheap—that’s another discussion for another time. I grew up in home that didn’t have a lot of money to spare. There were weeks when I know my mom had no idea how she was going to put food on the table for a family of five. We ate a lot of beans and rice. In this economy, not everyone can afford to shop at the local high-end natural foods market. And that’s okay. Winco’s produce isn’t always the best around, but they do have a fairly new organic section, and if you buy what’s in season you’ll be okay. Plus, they have an amazing bulk section full of dried fruits, nuts, spices, and other goodies that I have on my list on a weekly basis. If you’re just starting out on this lifestyle journey, don’t feel that you have to take out a second mortgage to put healthy food on the table. By making small changes where you can–swapping out that bag of chips for a new vegetable to experiment with in the kitchen–and adding in the freshest ingredients possible, you’re already making a step in the right direction. Next week, I’m going to share how I navigate the grocery store, and give you some tips and tricks for making the process easier and healthier. This weekend officially kicks off our crazy season. Between now and Father’s Day we’ve got a steady stream of family events on the calendar. As such, I wanted a pretty easy dinner week–with one exception. I’ve had a hankering for chicken mole lately, and am going to try my hand at it. It’s not hard, just somewhat time consuming and it contains small amounts of a lot of different ingredients as you can tell by the bulk section of our grocery list. Oddly enough, I had all the spices in my pantry already! Oh, and you’ll notice I only have 6 meals planned for the week, Because of a Mother’s Day/Birthday family event combo, I get a night off. One of our favorite dinners is this chorizo rice bowl. I always get an air fist “alright” from Andy when I tell him that’s what we’re having for dinner. It’s easy, super spicy, can be dressed up or down, and has the perfect combination of protein and veggies. When I started looking for weekend breakfast ideas, this is where my mind turned. The only real change I made to my original recipe was to top the bowl off with a few scrambled eggs. When I make this for dinner, I skip this step. The chorizo I buy is super spicy. Like, clear out your sinuses for hours spicy. It’s right at the threshold of what I can handle. I’m a wimp, but it’s still hot. If you’re not into the idea of a spicy breakfast, swap the chorizo for a nice breakfast sausage and you’re good to go! One more note on chorizo–if you can, try to find a good natural source. The prepackaged stuff in the refrigerated section of your grocery store often has questionable “animal parts” ground up and that’s just icky. If you’re adventurous, you can also make your own. Run the cauliflower through a food processor using the shredding blade, or grate it with a box grater. Set aside. 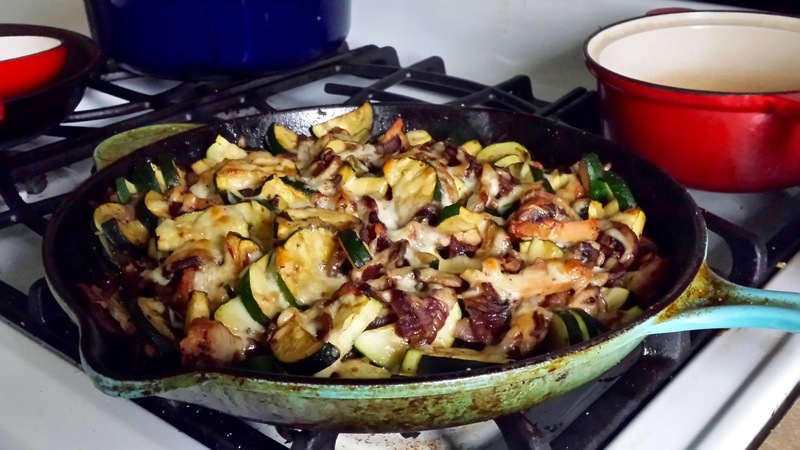 In a large skillet (I use my 10″ cast iron), heat oil over medium high heat. Add onions with a small pinch of salt and saute until onions start to get a little color. (I like a little char, I think it goes nicely with the spice.) Add the chorizo, stirring to break it apart, until browned and cooked through, 7-10 minutes. Once the chorizo is cooked, carefully stir in the cauliflower so the chorizo is evenly distributed. My skillet has a hard time holding everything (and it’s a good-size skillet) so stir with care. Cook until the cauliflower is tender and the chorizo flavor is all soaked in. Taste and season with salt and pepper as necessary. We’re really into pepper right now so we’ve been adding it to everything. Top with your favorite “fixins” and enjoy for breakfast or dinner! * I try to use a light hand with salt. Just a pinch to get the onions going and maybe a little more at the very end after I’ve tasted the dish. Depending on who makes the chorizo, the dish could be salty enough, and you don’t want to over do it. ** If you can’t do dairy, the sour cream and cheese aren’t necessary. We usually don’t use them, but it is an option and the sour cream especially helps cool the spice of the chorizo.